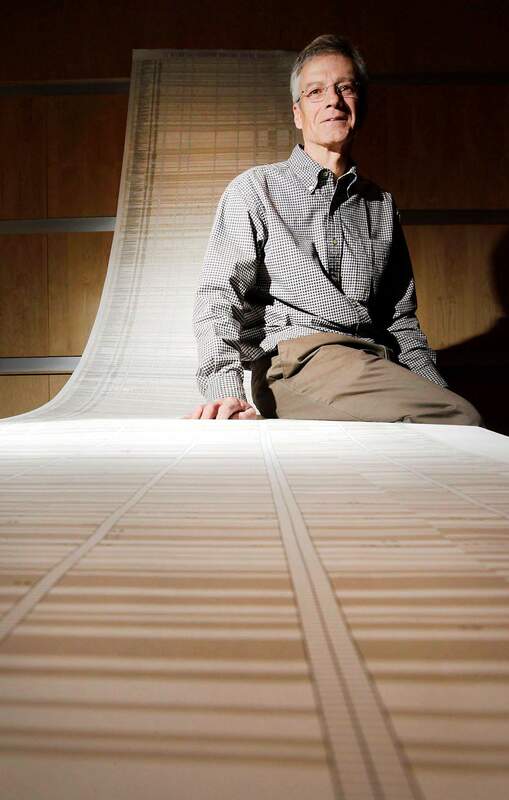 Paul Herz, a Fort Lewis College accounting professor, sits with his 16-foot long Excel spreadsheet that contains his research data. They may not be in their classrooms, but a handful of Fort Lewis College professors are breaking new ground and in some instances, even pulling Durango into the national spotlight. The opportunity for these advances is provided by sabbaticals – when educators take a break from their regular schedules to delve into special projects. Provost and Vice President of Academic Affairs Stephen Roderick said the practice elevates the reputation of the institution and strengthens the faculty’s professional prowess. “The benefit of ongoing faculty research keeps those faculty members alive in terms of their knowledge of their own profession,” said Roderick, who oversees the sabbatical application process. “Sabbatical” is a term that traces back to biblical times when it referred to a year of rest for the land observed every seventh year in ancient Judea. In modern academia, professors become eligible for sabbatical after six years of service. The college pays faculty, who can apply for either a one-term or a full-year sabbatical, half their usual income. To understand how this tradition plays out on the ground, the Herald peeked in on the projects of all FLC professors currently on sabbatical. Helm is discovering new ways to store and harness the power of renewable energy. He and his team of researchers at Pacific Northwest National Laboratory in Washington state have taken a nickel compound Helm has made and are using it to produce hydrogen on a scale that hasn’t been done yet in the world, Helm said in a telephone interview. Helm’s team members recently submitted their first publication to the journal Science, which is expected to print sometime this month. In addition, Helm will bring two FLC students to the laboratory in July to work as interns, he said. Walker is using her one-term sabbatical to work on a book tentatively titled The Top Ten Economic Myths My Students Bring to the Classroom, which will debunk what she said is the popular-but-wrong idea that spending drives an economy. Walker also is writing journal articles about several economic theories, including the definition of wealth and the new stakeholder theory of the corporation, she said. In addition to her writing, Walker said she is updating her courses. Shuler, whose one-term sabbatical is his first in a 20-year career, said he is developing a prototype web-based tutorial on using mulches and cover crops to manage weeds organically. Shuler said he sees more and more students at the college interested in organic gardening and farming. “My hope is that these students will implement and spread the word about these techniques to other agriculturalists as they move into various post-college careers and activities,” he said. Owen, who has taught at FLC for 22 years, is working on five separate projects that aim to test the boundaries of reason, he said. The projects were conceived in the summer of 2009 when Owen was working on a paper concerning how humans justify their beliefs. After his paper met with skepticism, Owen said he realized the need to address additional topics so he could build a stronger foundation for his original rationale. Owen plans to present his papers at philosophy conferences and will likely publish in an academic journal, he said. McCormick began his sabbatical last summer in Bogota, Colombia, where he presented a paper on the relationship among immigration, environment and ethnicity in the Southwest and the southern plains. McCormick’s presentation was the culmination of his previous work, and a starting point for the work he’ll continue until his August return to the classroom. “What’s going on right now, in the Americas but also elsewhere, is there are refugees getting flung around all over the place, and it’s probably going to get much worse because of natural disasters and climate change,” McCormick said. McCormick, whose work focuses primarily on the Southwestern United States and the Dust Bowl region, said he is learning more about why people move, how they adapt, and how they impact new environments. Herz, who is on a full-year sabbatical, is using his time to become an international accounting expert. Herz, who has taught at the college for seven years, lectured under a Fulbright scholarship at a Russian university in 1999 and 2000. Now, he is developing expertise in International Financial Reporting Standards, which are expected to be phased in by the U.S. Securities and Exchange Commission around 2015. Some public accounting firms have said students without an international accounting background will not be hired, he said. Herz said he worked every day last summer and into the fall with Computer Science Professor Charles “Skip” Page on a database that compiled information into a 16-foot-long, 4-foot-wide spreadsheet, which took his co-author, Robert Larson, eight years to create. The spreadsheet organizes data from thousands of entities and individuals around the world using the international standards and serves as a good indicator of the accounting world to come. Wendland is creating a series of wall-mounted, low-relief sculptures based on John Bunyan’s The Pilgrim’s Progress, according to her sabbatical application. A Minneapolis art collector awarded Wendland a commission to create the series in April 2008, her application said. She has a flexible budget, creative control and will retain all rights to reproduction and exhibition. Wendland could not be reached for comment.